The Clean Space One Project has passed a milestone. 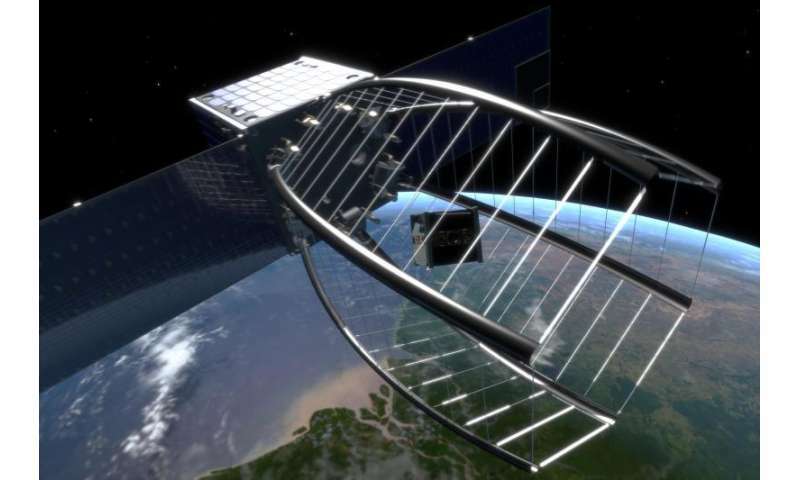 The space cleanup satellite will deploy a conical net to capture the small SwissCube satellite before destroying it in the atmosphere. It's one of the solutions being tested for eliminating dangerous debris orbiting the Earth. 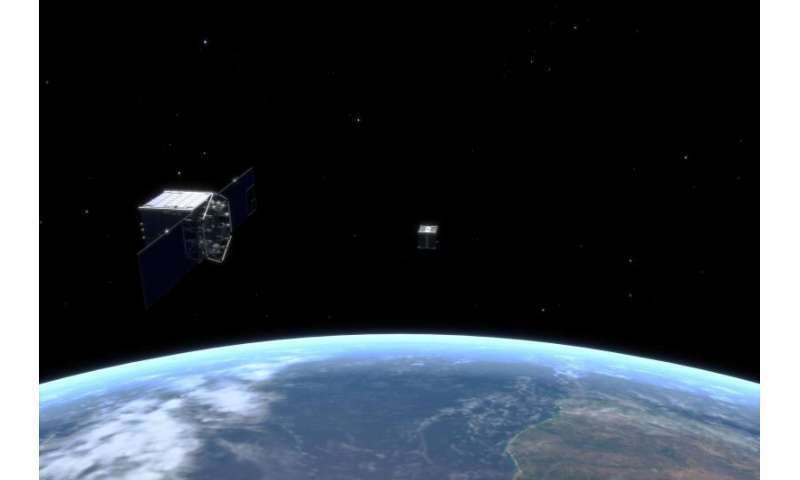 The SwissCube satellite has been in Earth orbit for more than five years. The challenge was to ensure that it wouldn't become just one more piece of space garbage. 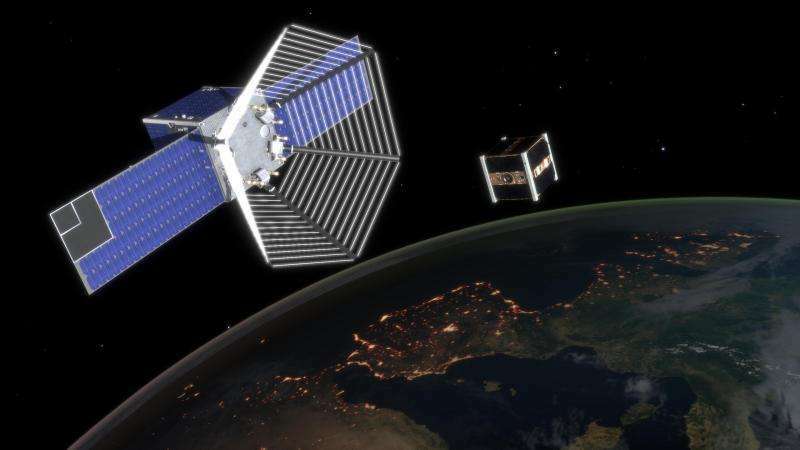 Engineers from eSpace, EPFL's Center for Space Engineering and Signal Processing 5 Laboratory (LTS 5), and partners from HES-SO were confident they could meet this challenge, thanks to CleanSpace One (CSO). 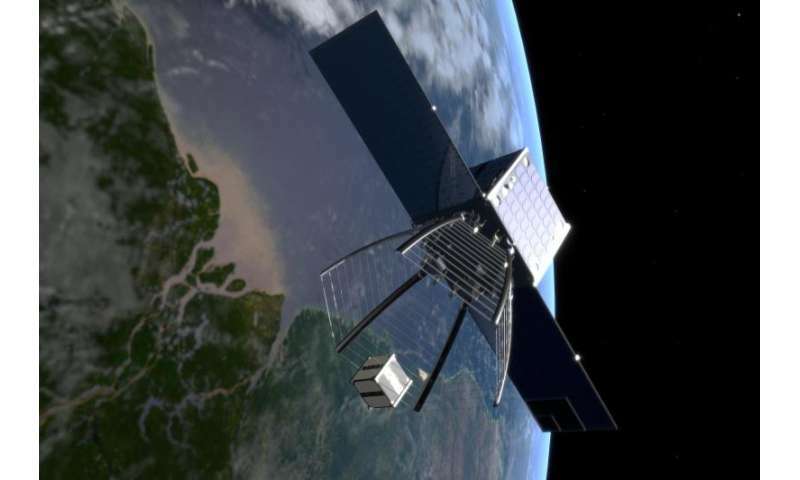 For the past three years, they have been working on this space cleanup satellite that will be sent into orbit to recuperate SwissCube. It will trap the small satellite and the two will combust together in the atmosphere. A major step forward has been made with critical decisions being taken on the design of approach and capture systems. Space debris runs the gamut from broken down satellites to spent rocket stages; this detritus of all sizes and shapes orbiting the planet is increasing at an alarming rate. At a speed of 7 km/second, these pieces of space trash become powerful projectiles and constitute a serious threat to the devices and people working in space. In order to reduce these risks to a minimum, NASA carefully monitors every item larger than 10 cm. Many actors, including CleanSpace One, are currently working on long-term solutions for recuperating and eliminating all this stuff. And it's a tougher job that one would think. "SwissCube is not only a 10cm by 10cm object that's tough to grasp, but it also has darker and lighter parts that reflect sunlight differently," explains Christophe Paccolat, a PhD student working in LTS5. "These variations can perturb the visual approach system and thus also the estimates of its speed and distance." Muriel Richard-Noca, head of the project, emphasizes the extreme delicacy of the mission: "It only takes one error in the calculation of the approach for SwissCube to bounce off CleanSpace One and rocket out into space." To avoid these kinds of disasters, the visual approach algorithms on the cleanup satellite's cameras are currently being tested. To be accurate, they must take into account a variety of parameters, such as the angle of illumination of the Sun, the physical data of CubeSat, the relative speed at which it is moving and all the uncertainties involved in this measurement, and the speed of its own rotation. To design the most efficient capture system, the engineers benefited from the collaboration of microengineering students from the University of Applied Science in Geneva (HES-SO HEPIA). The students came up with various solutions, from articulated arms with claws to a system of tentacles. They finally opted for the so-called "Pac-Man" solution. The prototype resembles a net in the form of a cone that unfolds and then closes back down once it has captured the small satellite. "This system is more reliable and offers a larger margin for maneuvering than a claw or an articulated hand," says Michel Lauria, professor of industrial technology at HEPIA. Similarly, students and professors of the University of Applied Science Valais (HES-Valais) and HE-ARC lent their efforts to the signal processing (vision) of the project by ensuring that the high-performance processors are prepared for operation in space. CleanSpace One could be launched as early as 2018 in collaboration with the company S3, headquartered in Payerne. The development of the approach and capture systems has passed the prototype stage, which involved making critical choices for the project. The next stage will combine putting together the first version of the engineering models – which will be more accurate than the prototypes – and more extensive tests. Seems like it would be far more efficient to have designed some propellant in the SwissCube satellite to be used to send it out of orbit into the atmosphere to disintegrate there. Perhaps all limited lifetime satellites should have such a feature. Or we might deploy the proposed earth based laser systems to slow satellites so they eventually disintegrate in the atmosphere as well. Agreed. Using one cleanup satellite to grab and decommision just one object is not very cost effective or environmentally friendly for Earth. It would take tens of thousands of launches just to clear up the current debris.